The 34th annual USHLI Conference was held in Chicago and once again drew hundreds of students and educators onto the grounds of the Sheraton Chicago Hotel and Towers February 18th through 21st to develop leadership skills, explore career options, and garner national contacts. 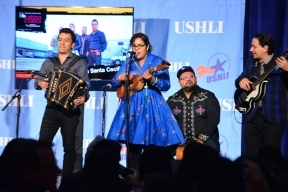 The USHLI Conference has become the leading Hispanic leadership conference in the nation. Over 6,000 students representing 40 states attend the four day conference. 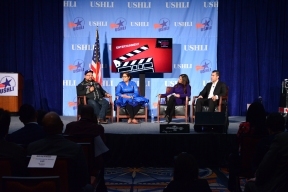 This year, USHLI hosted “I am Latino in America” Forum moderated by Soledad O’Brien where attendees gained insight from notable speakers. To learn more about USHLI, visit www.ushli.org. Photo 2: Left to right: Miguel Ramirez & La Marisoul, Members of Band ‘La Santa Cecilia’; Soledad O’Brien; & J.W. Cortes, actor (Fox’s Gotham) and Marine Combat Veteran. Photo 3: Left to right: J.W. 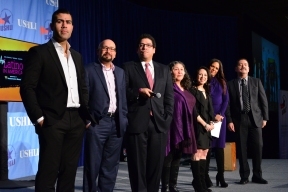 Cortes; Dr. Adrian Pantoja, Senior Analyst, Latino Decisions; Kelvin Roldan, Chief Communications & Public Policy Officer, Hartford Public Schools; Sylvia Puente, Executive Director, Latino Policy Forum; Maria Hinojosa, Host, Latino USA; Soledad O’Brien; Jesus ‘Chuy’ Garcia, Commissioner, Cook County Board, 7th District.